Can I send a gift certificate for a downloadable game? Visit our Gift Certificates page to give the gift of games. If you'd like to buy a gift certificate with a Game Club credit, please click here to start. Gift certificates can be instantly sent to friends and family by email and redeemed for any PC or Mac standard version game. *Prices are in USD. Other currencies available. The recipient will get an email with the gift certificate and a personal message from you. You can also recommend a game that you like. Click here to view a sample gift certificate. Click here to go to the Gift Certificates page. Select to purchase a 1 Game or 5 Game Gift Certificate. Enter your name, email address, and the name and email address of the recipient. Include a personal message (optional). Use your remaining Game Club credits to purchase 1 Game Gift Certificates. Each individual gift certificate is valid for one standard version game. Please note: Multiple Game Club credits are unable to be combined for a 5 Game Gift Certificate. Go to your My Game Club page, click the Start Gifting button, and then follow the on-screen instructions. Need help redeeming a gift certificate? Sign in to the Big Fish Games site, or create a Big Fish account if you don't already have one. Find a standard version (not a Collector's Edition) PC or Mac game and click Buy Now on the game page. In the shopping cart, type your gift certificate coupon code into the Have a coupon code? box and click Apply Code. Review your subtotal and click Place Order to submit your order. Redeeming a 5 Game Gift Certificate? When redeeming a 5 Game Gift Certificate, you can use it to get multiple games (up to 5) in the same order or you can use it to get individual games in separate orders. No matter how you choose to redeem the gift certificate, it will expire after you've used it on 5 games. We recommend that you copy and paste your code to avoid errors. PC users: Highlight the text, then hold down the Ctrl key while pressing the C key to copy. Then hold down Ctrl and press V to paste. Mac users: Hold ⌘ and press C to copy, then hold ⌘ and press V to paste. 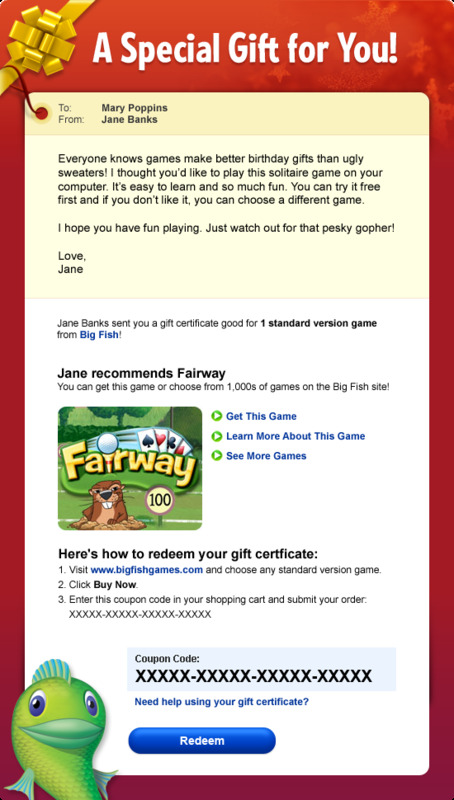 If I redeem a gift certificate, will I become a member of Big Fish Game Club? Redeeming your gift certificate will not start a Game Club membership.